Paul Gilding on TED Stage. Paul Gilding is a writer and advisor on sustainability. He is also the former global head of Greenpeace. Gilding has taught at Cambridge University, owned and operated two sustainability-focused companies and been a consultant to many CEOs of the world's largest companies. He is also the author of the book The Great Disruption, and currently travels the world advising people in businesses, community groups and government about the global economic crisis. On the show today, ideas about measuring progress. And we can't really talk about progress without talking about the one thing that might unravel all of it. And that thing is climate change. So, Paul, in 2012, you gave this very dark TED Talk. PAUL GILDING: Let me begin with four words that will come to define this century. RAZ: And your opening line was, like, the earth is full. GILDING: The earth is full. It's full of us and full of stuff, full of our waste, full of our demands. RAZ: Like, you were saying we're kind of in trouble. GILDING: In other words, to keep operating at our current level, we'll need 50 percent more Earth than we've got. RAZ: But now, you know, six years on, things are much better, right? We're doing great, right? GILDING: Look. It's like living on your credit card. When you're living on a credit card, life is good. You know, you can buy the stuff you need. Life is ticking along. And then one day, the bank goes and says, I am sorry, got to pay it back now. And Mother Nature is basically saying now, like, hey, the card is full, time to start paying it back. And we don't want to. RAZ: This is Paul Gilding. He's a writer and an environmental activist. GILDING: And have been trying to convince the world to act on sustainability for 45 years or so, not very successfully. RAZ: So while some of the numbers do tell a story of progress - poverty is down, we're living longer and healthier - Paul says they also tell another story that we've been ignoring, a story about a world that's been growing too fast for too long. And now, he argues, we've reached the limit. GILDING: So the resources that keep us alive, that give us the water we need, the food we need, that make the oxygen that we breathe by processing the pollution, et cetera, et cetera, the capacity of the Earth to support us is past its capacity. RAZ: You know, we've heard from Steven Pinker about all of these amazing developments - global developments - that are irrefutable. I mean, hundreds of millions of people have been lifted out from poverty. It seems like a pretty great story. GILDING: It's a great story. The problem is that we've got another three or four billion people who'd like to follow them. And they have every right to do so. The question is physically, can we sustain that world? So what, in a practical sense, that means is that the food supply becomes unstable. We can't produce enough food cheaply enough and go to the right places to feed enough people. And political instability accelerates, and conflict between nations accelerate, trade slows down, and all those things lead to an economic downturn. And then we crash. GILDING: Many of you will be thinking - but surely we can still stop this. If it's that bad, we'll react. 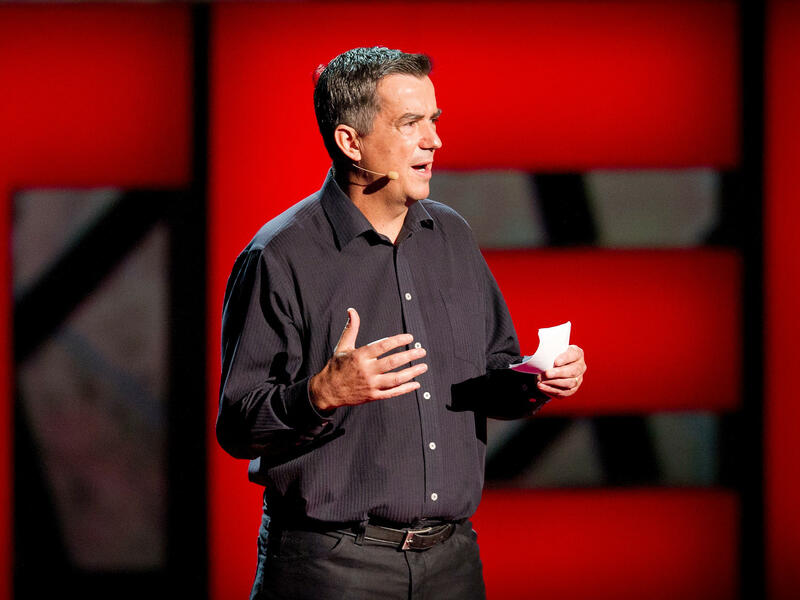 RAZ: Here's more from Paul Gilding on the TED stage. GILDING: Let's just think through that idea. Now, we've had 50 years of warnings. We've had science proving the urgency of change. We've had economic analysis pointing out that, not only can we afford it, it's cheaper to act early. And yet the reality is we've done pretty much nothing to change course. We're not even slowing down. Last year on climate, for example, we had the highest global emissions ever. The story on food, on water, on soil, on climate is all much the same. So when does this transition begin? When does this breakdown begin? In my view, it is well underway. We see spiraling debt crises. We see growing inequality. We see money's influence on politics. We see resource-constrained food and oil prices. But we see, mistakenly, each of these issues as individual problems to be solved. In fact, it's the system in the painful process of breaking down - our system of debt-fueled economic growth, of ineffective democracy, of overloading planet Earth - is eating itself alive. RAZ: OK. So let's say the numbers are going to lead us in one of two directions. Direction A, we say, all right. We need to freeze growth. We need to start doing that now. What do we do? How can we do that? GILDING: Yeah, so for a start, we are not going to be able to convince a population who's been brought up on growth as the pre-existing requirement for quality of life to suddenly stop growing. So what we need to do is to divert growth dramatically and urgently to accelerate the economy rapidly to stop climate change and other issues getting out of control. RAZ: Wait. Sorry, I didn't get that. We need to accelerate the economy to stop climate change? Isn't that - doesn't that make things worse? GILDING: No because to accelerate the economy in the direction of solving climate change, we decelerate it dramatically in terms of the spending and consumption on fossil fuels, for example. So we know we need to wipe out whole industries. Companies in the fossil fuel sector, in oil and coal and gas need to cease to exist. They need to be replaced by other companies that, by the way, create more jobs. We could eliminate fossil fuels from the economy, right, inside 10 years, and it would be a positive economic impact. We're also, by the way, inventing new technology all the time to make it better, right? We've got extraordinary opportunities in artificial intelligence, in solar power, in autonomous vehicle and transport as a service, so we have to think differently about how we consume - doesn't mean we don't consume, doesn't mean we go out and live in caves, doesn't mean we have a horrible quality of life. But it does mean we don't live a life that results in most of our stuff ending up in the oceans and landfill and incineration because that's not a sustainable economy. Then we're going to have to face up to, is that enough? But in the meantime, it will be enough. RAZ: And you're like, this thing's never going to get off the ground. GILDING: It'll be OK. It'll be OK.
GILDING: So if you'd painted that picture then of World War II, the bombing of Pearl Harbor, of the, you know, invasion of all these countries, of this catastrophe and the Holocaust, et cetera, et cetera, people would say, oh, my God, that's the end of the world. We'll never survive that. GILDING: And we'll never recover the emotional, political trauma of that process. And look what happened. It was horrible. It was tragic. It was, like, beyond our comprehension how bad it was, but then society moved on. And we went through that process. And we successfully moved into a different era. So the point is it's always hard to imagine these things before they come. GILDING: It's very hard to prevent them for that reason. And therefore, we wait until the crisis is completely out of control, and it's, like - it's well past the last minute in which you have to respond. And then we react and then we do extraordinary things. And that's the essence of my story that I'm telling. Now, that wouldn't help if this was really hard to fix. But the reality is there is just amazing amounts of possibility as to how we could fix this, so this is not like World War II. World War II was really hard to imagine how the Allies could win at the beginning. This is not hard to imagine how we could win. We just got to decide to do it. RAZ: Paul Gilding. He's the author of the book "The Great Disruption" and the former global head of Greenpeace. You can see his full talk at ted.com. DAVID BOWIE: (Singing) Please don't tear this world asunder. Please take back this fear we're under. I demand a better future or I might just stop wanting you. I might just stop wanting you. RAZ: Thanks so much for listening to our episode The Story Behind The Numbers this week. If you want to find out more about who was on it, go to ted.npr.org. To see hundreds more TED Talks, check out ted.com or the TED app. Our production staff at NPR includes Jeff Rogers, Sanaz Meshkinpour, Jinae West, Neva Grant, Rund Abdelfatah, Casey Herman, Rachel Faulkner and Diba Mohtasham with help from Daniel Shukin. Our intern is Megan Schellong. Our partners at TED are Chris Anderson, Colin Helms, Anna Phelan and Janet Lee. I'm Guy Raz, and you've been listening to ideas worth spreading right here on the TED Radio Hour from NPR. Transcript provided by NPR, Copyright NPR.